Jeju volcanic island is an example of a large shield volcano, a lesser common type of volcano and rare in its enviromental setting. 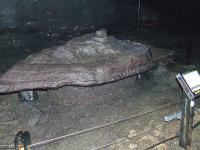 Its most distinctive feature however is its system of lava tube caves. 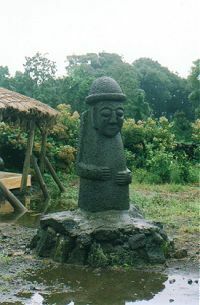 Jeju island is the equivalent of tropical paradise, especially for regional tourists. The Hawaii of South Korea, with its sunny climate and even real palm trees. On the flight that I took from Busan to Jeju were at least 100 elder women, excited as children going on a school trip. Arriving at Jeju airport however, the island is covered in fog and rain. The next day it is still raining. I decide to join a bus tour, to get an easy (and dry) glimpse of the island. The tour takes 8 hours, and circles the eastern part of the island - the vulcano crater, lava caves and the open air museum are included. I'm joined by about 10 Koreans and a German girl. We (the westerners) haven't got a real clue where we are going, so a surprise tour it is (the guide only speaks Korean). First we stop at the "Mystery Road", an optical illusion. Really strange, but funny. The Sangumburi crater is stop number two. This should be an impressive sight, a large green volcanic crater. Now only fog, just the edge of the crater can be seen. So we go on. Most of the Korean passengers are fast asleep now. Next stop is the Song-Eup Folk Village, an open air museum where we are lured into a tent where a sales presentation of health products is held (tea, pills). The Koreans are wide awake now, and buy in large quantities. After a great bulgalbi lunch we go horse riding. Two brave Koreans from our group are given a cowboy hat and boots, and sit on a horse for 10 minutes in the pouring rain. The bus route now takes us to the coast, to the Sunshine Peak. We end up at the lava caves of Manjanggul. There we have an hour to follow the trail that the lava has made underground. The most impressive sight of the day in my opinion. The caves are cold and dark, and their walls are moulded into strange forms by the lava. Most of the Korean co-passengers have stayed in the bus by the way. The day ends at a fish restaurant, where the Koreans start being attentive all again and where I have my first freshly cooked octopus. In June 2017 I spent a couple of days visiting Jeju, where I stayed at Hotel RegentMarine, which is located in Jeju City on the waterfront between Black Pork Street and Raw Fish Street (those are the actual names in translation). On my first day, I visited Jeju City, where I had lunch on Black Pork Street at Restaurant Dombedon, probably the world's only Michelin-starred pork barbecue restaurant. 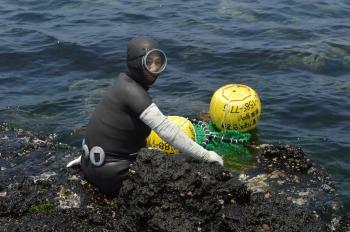 For dinner, I ate on Raw Fish Street, where my abalone was likely harvested by a Haenyeo, free-diving women who can descend for up to three minutes and reach depths of nearly 65 feet. For my second day, I arranged for a car and driver (Kimi9461 (at) hanmail.net) and visited the Manjanggul lava tube and Seongsan Ilchulbong tuff cone, components of the Jeju Volcanic Island and Lava Tubes UNESCO WHS. I also visited two museums, Jeju Haenyeo Museum (which tells the story of the Haenyeo, who plunge to the sea floor to catch crustaceans, mollusks and octopi) and Jeju Loveland (an outdoor, sexually-explicit sculpture park). Mr. Kim also arranged for us to be quickly seated, avoiding the typical hourlong wait, for lunch of abalone porridge at Myeongjin Jeonbok Abalone Restaurant, probably the most well-known and popular on Jeju. Across from the restaurant, I was able to watch many Haenyeo dive to catch crustaceans and other sea creatures (the attached photo is of a Haenyeo, who were far more interesting than the WHS). I visited this WHS in April 2017. I visited all 3 locations over 4 days, namely the Manjanggul Lava Tube from the Geomunoreum Lava Tube System, Mt Hallasan and Seongsan Ilchulbong Tuff Cone. All entrances have free admission in April. 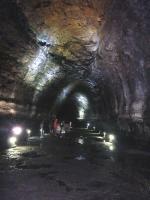 The only lava tube open to tourists is the Manjanggul Lava Tube which is 7.4km long, 18m wide and 23m high. Only 1 km is accessible but it is more than enough to grasp the OUV of this unique lava tube. The vast majority of lava tubes are formed by a basaltic lava flow which contains less viscosity. When the lava flow from the volcanic crater stops, it forms an empty space shaped like a tube. Thenm the lava flows continuously into this tube, the ground melts down in the high temperature and deepens gradually. A number of impressive lava formations can be observed while walking underground for 1km: lava flowstones, lava rafts, lava shelves, lava stalactites and stalagmites, lava flowlines, quartzite fragments and last but certainly not least, the world's largest known 7.6m high lava column (picture, top right). The small information centre has a number of information boards and lava fragments as well as the original UNESCO certificate (picture, top left). The second location I visited was Mt Hallasan. This is where a rental car comes in handy as I managed to drive through the never-ending maze of green tea plantations (not the ones at O'Sulloc; picture, bottom left) beneath Mt Hallasan. 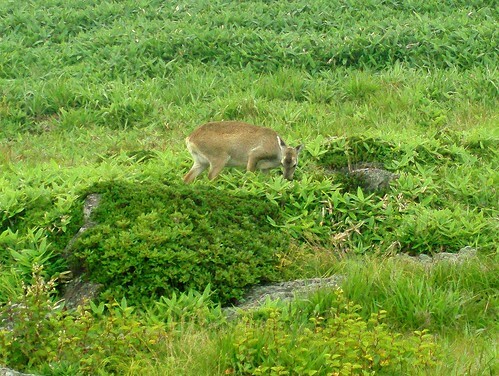 The mountain peak is also visible from Yongmeori or from Jungmun. The third location I visited was the Sunrise Peak tuff cone. As the name suggests, the views at sunrise (on a clear day) are incredible (picture, bottom right). Here I could clearly experience the unequalled quality of scenic value (criterion vii) and the world class geological value (criterion viii) of this WHS. The 180m climb to the top of the tuff cone is very worthwhile but if you wait around 30 minutes after sunrise, you'll be rewarded with similar views but without the crowds. The tuff cone is also visible from the Phoenix Island Resort as well as from U-do island. If you have time to spare, there are several short hikes to the black sandy beaches beneath the tuff cone. Overall, I enjoyed my time in Jeju. The island proudly displays its 3 titles, namely UNESCO world natural heritage, part of the Glocal Geoparks Network and 1 of the 7 wonders of nature however you'll need a significant dose of patience and time to take in the 3 locations before the bus loads of Chinese and Korean tourists. I'd recommend a visit to the Yongmeori Coast as well as U-do island by ferry (possible future extension). Heavily promoted as one of the new seven natural wonders of the world, Jeju Island, an oval volcanic island in the East China Sea, is a different country of South Korea with its different landscape, climate, architecture or even the taste of kimchi. Jeju is not a new discovered destination for me; my Korean friend often posted their honeymoon photos on Jeju on their webpage, Jeju is popular for Korean honeymooner, and during my last trip to Seoul, I saw many advertisements of its new seven wonder campaigns, even a large booth in Seoul Station for clicking the vote, so when I decided to visit Korea again, part of my annual Asian trip this year, I requested to visit Jeju as my prime destination to discover this island. The best way to see Jeju is to rent a car, after landed at Jeju Airport, my first place to visit was the famous Manjanggul Cave; the lava tube cave is indeed a great site, very interesting, unique and definitely the best site of Jeju. While I really enjoyed the place, I also really concerned with the protection of the cave, currently tourists can freely touch and walk inside which finally someday will damage the cave and its unique lava surface. My next destination was the famous sunrise peak or Seongsan Ilchulbong which is actually an eroded volcano next to the sea; I was surprised to discover that the peak is surrounded by a very big town and large car park with hundreds of bus tours, clearly the peak is very popular. The peak itself is quite nice with its beautiful green lawn, high cliff and seacoast landscape, but with thousands of tourists, the place was really chaotic and noisy and made the whole experience not quite enjoyable. Actually I had much more enjoyable time seeing Seongsan Ilchulbong from the nearby beautiful Seopjikoji Peninsular or Phoenix Island Resort, and as already mentioned by Paul, the works of Tadao Ando are very interesting and his design use Seongsan Ilchulbong as part of borrowed landscape is very classy. Due to bad weather on Hallasan, I only saw two parts of the Jeju's World Heritage Site. The island is indeed a nice place to visit especially for its unique volcanic wonders not only the lave tubes but many beautiful lava coastline. For other manmade tourist attractions I found them are just fine and sometime to bizarre to visit. The food on Jeju is also nice especially abalone and other seafood, local products made from cactus and its local orange are quite good for souvenirs and interesting for their taste. In my opinion, UNESCO sites on Jeju, especially Manajanggul Cave, are one of the best sites that Korean offered to the World Heritage and should be seen at least once in a lifetime. Another day, another island on our RTW cruise – but this visit to Jeju was more critical than most as it offered the promise of a completely new WHS after a long period of “revisits” since Rapa Nui on the other side of the Pacific! With just 9 hours ashore we somewhat reluctantly decided to use a standard tour which promised to take in 2 of the 3 elements of the inscribed site, together some more of Jeju’s delights! The big worry was whether the tour would give us enough time at our priority sites and after visits to a crater, a folk village and a resort it was after lunch before we reached the Seongsan Ilchulbong tuff cone, otherwise known as “Sunrise Peak” (Our lunch by the way was served in the visually stunning “Glass House” by Tadeo Ando – well above the normal quality of restaurant used for tourist groups around the World but it was a pity we couldn’t also take in his “Genius Loci” or the interior of Botta’s “Agora” at the same Phoenix Island location!). We were then presented with an option – either go to see the Haenyeo diving ladies whose “show” commenced at 1.30 or climb to the top of the crater – in either case we would leave in 1 hour and it was now 1.05!! Well there was no alternative of course but to try for both - and it was well worth doing so too. Seongsan Ilchulbong is often described as a huge offshore stone castle with sheer cliffs all round – in reality it is connected to “mainland” Jeju by a spit of land but the climb starts only a bit above sea level and climbs steeply to the summit at 182 metrs. It was a popular spot and the stairway got very crowded. 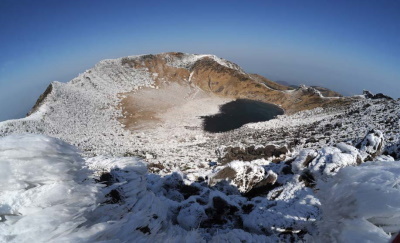 The summit revealed that those steep sides hid a deep circular crater (its floor just 90 metres above sea level) - this is a “volcanic cone formed by Surtseyan-type hydrovolcanic activity about 5,000 years ago” (Wiki). The views on all sides were spectacular from the very narrow summit ledge. So, it was on to the “main event” – the Geomunoreum lava tube system “regarded as the finest lava tube system of caves anywhere,” (UNESCO – though Hawaii et al might disagree!). Arrival at 2.40 gave us a full hour to cover the underground walk with reasonable time to take in the atmosphere and the numerous geological phenomena on display. Only 1 km of one of the tubes, that of Manjaggul, is open. Its entire length is 13.4kms with a height of 23m and a width of 18m (photo). We had visited lava tubes in USA but found Manjaggul a worthwhile experience, well presented with informative signs. 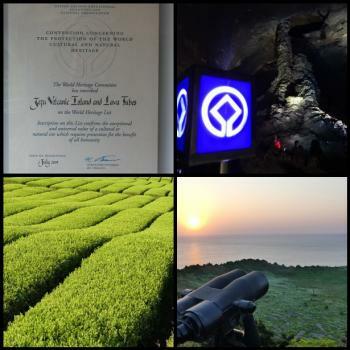 Both Seongsan Ilchubong and Manjaggul deserve a bit of research before and after a visit to help understand the geological processes which created them and what makes them special enough to be inscribed. Ok, Jeju requires more than the 9 hours we gave it, but I felt we used our limited time reasonably well and, in particular, that we did justice to the 2 WHS elements we visited (and we saw the third as we sailed away with the sun shining brightly on the snow capped peak of Mt Halla!). Jejudo, which means Jeju Island, is the biggest island of Korea and its most touristic area for Korean people dreaming of beautiful beaches and nice sea. The WHS there mainly consists of the Hallasan mount, an extinct volcano culminating at almost 2000 meters and the lava tubes inside which you can walk and enjoy the natural sculptures made by lava and water. The Volcano is a great national park in which people hike and climb to the top. Four different ways allow to get to the top and are more or less easy to use. Whatever the one you take, you will have several hours of hard walk to get to the top and same thing to get down. However, you will enjoy the beautiful landscape of the park with its fauna and flora and its different places between forests, solid lava, water falls and cliffs. Lava tubes are really amazing and offer a natural testimony of the work made by lava first and erosion then. A memorable part of visiting Jeju was meeting so many friendly visitors, mostly local, on ther ferry from Mokpo to Cgheju-do. But I did visit some of Jeju's volcanic attractions. one day I took a bus from Jeju-do up to Seongpapak on the side of Mount Hallasan and from there gained some views of the summit, as well as visiting the WHS museum there. on another day I took a different bus heading to Seongsan Ilchubong and got off near the Manjanggul lava tubes and went for a 2km hike down through a tube, a black tunnel big enough to run a train through. Along the way were some beautifully illuminated lava formations. The 1 km open for visits is only a fraction of what is there. Returning to the bus stop I caught another bus to Seongsan Ilchubong, clearly a place of pilgimage for the hundreds of people gathered there to climb to the summit. An incredible island with volcanic lava tubes, the beautiful Hala mountain, and a distinct culture from that of mainland Korea. Also the ilchul-bong is a must see crater located on the eastern edge of the island. This paradise is full of delicious seafood, friendly people, fascinating "stone grandfather" statues, Haenyo Women Divers, and numerous waterfalls. Visitors planning a trip should really consider their timing, because for Koreans there are definitely high and low seasons in regards to tourism, and the island can become quite busy. 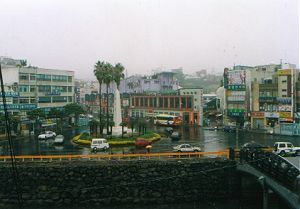 Moreover, foreign visitors can rent cars or smaller vehicles on Jeju, which is less restrictive than mainland South Korea. Setting up your hotel should also be considered carefully, Jeju City or Seogwipo. I chose the later, but it really depends on your travel priorities. Besides the 3 inscribed areas (Hallasan, Geomunoreum Lava Tube System, and Seongsan Ilchulbong), there is talk of expanding the property to Yongmeori coast, additional caves and oreum, and potentially even some of the smaller volcanic islands off the coast of Jeju-do. I would certainly welcome an extension. 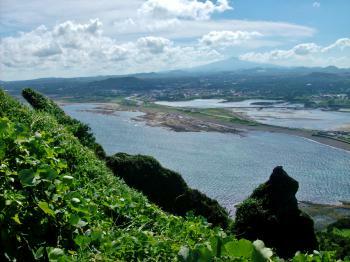 Nevertheless, a trip to Jeju is a highlight for many who visit Korea. I am in Jeju at the moment. i have been to these World Heritage sites with Bus tour which Yeha Tour provide the East Tour and the West Tour. Their courses are covered the World Heritage site. it's fantastic time. Drifting Across the Sea: A Record of Ming China: (Departure from Jeju Island) 3rd day, Intercalary First Month, 1488. [February 15th] At Sea. This day was cloudy and sometimes rainy. The wind was from the east and slightly favorable. "Chol-lyo and Tung-nye tried to stop me from going, saying, "We old men were born and grew up by the sea lanes. When it is changeable on Mt. Halla, now cloudy, now rainy, the wind is sure to shift, and it will be impossible to sail boats." One million visitors or more: Ilchulbong Volcanic Cone recieved 1.2 million.